Makati City, March 22, 2019. I’M Hotel was just across the street from the hotel where this writer usually stays in Manila. When I heard the news on television, I immediately went down to investigate but the area had already been cordoned off by police. The hotel Resident Manager confirmed that there was indeed such a tragic incident. 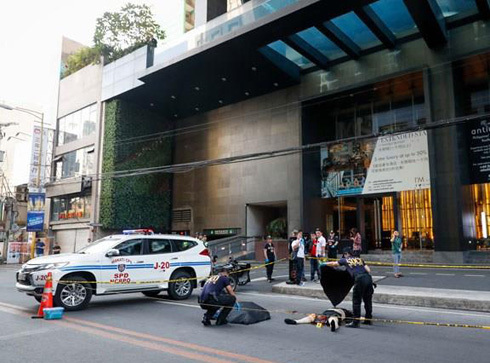 Two Korean men lay dead on the street in front of I’M Hotel, Makati. 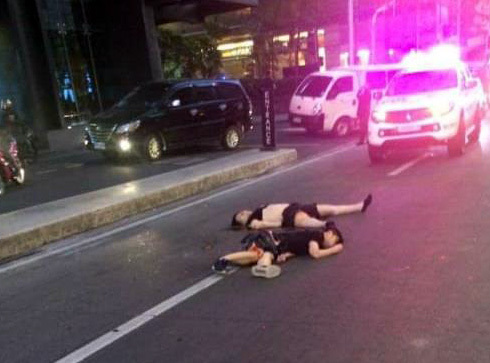 Two lifeless and bloodied bodies lay dead on the street. It was a gruesome sight. I had my phone and was about to take some pictures but was prevented by an over-zealous security guard. I told him I represented media. The guard asked me for my press ID. I had to go back to my hotel room to get my press ID. By the time I got back, the bodies had already been covered. Scene of the Crime Operatives (SOCO) were quick to respond and cordons off the site. Earlier reports suggest the two men may have fallen from their balcony. However, if they simply fell from the balcony of their room which was on the upper floor of the hotel, the men should have landed on the swimming pool located on the 2nd floor of I’M Hotel. They might have survived the fall. The trajectory indicates that they jumped or were thrown out; thus, they missed the pool and landed on the street. Unverified reports from hotel staff indicate that the two Koreans were already quarrelling when they checked in. Therefore, one of them must have pulled the other’s hand. Another conspiracy theory was that the men were gay lovers and must have mutually consented to a suicide pact.